TIPON.- Tipon was a center for the worship of water. The irrigation system was unusual in that it featured deep, vertical channels in the terrace walls. 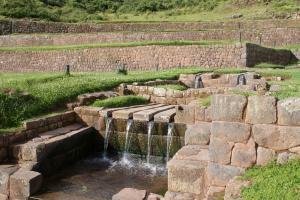 The system was fed by a natural spring from the sacred mountain known as Pachatusan which flows to this day. PIQUILLAQTA. 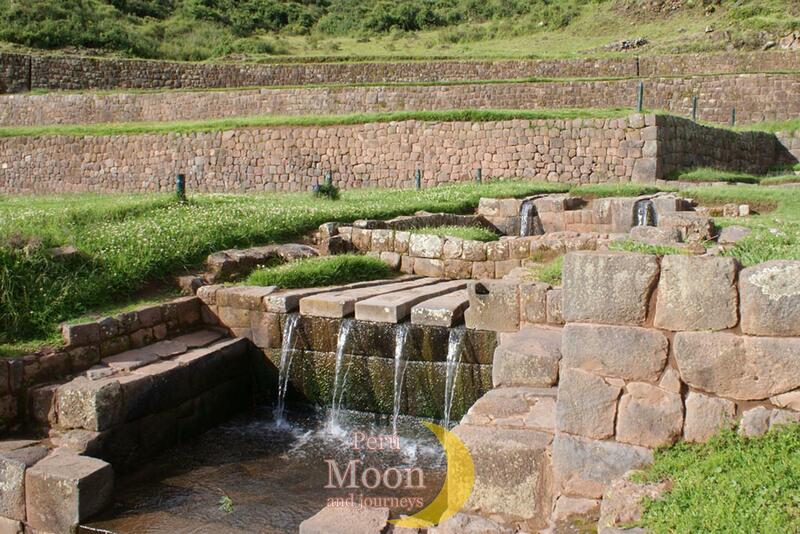 - This is a huge sprawling site, interesting because it is the only ruin of a pre-Inca city in the Cusco region. It is attributed to the Wari culture, which emerged in the central highlands near present-day Ayacucho, flourished around 1000 AD, and may ultimately have been overwhelmed by the Incas. ANDAHUAYLILLAS. - "Rumicolca" was once the gigantic stone gateway to the Cusco valley, and we pass through the narrow valley it guards on our way to the village of Andahuaylillas, whose famous colonial church is known as the "Sistine Chapel of America" because of its beautiful painted ceiling and other art treasures.